This seed recipe works for any of the winter squashes: including butternut, acorn, pumpkin, & spaghetti. 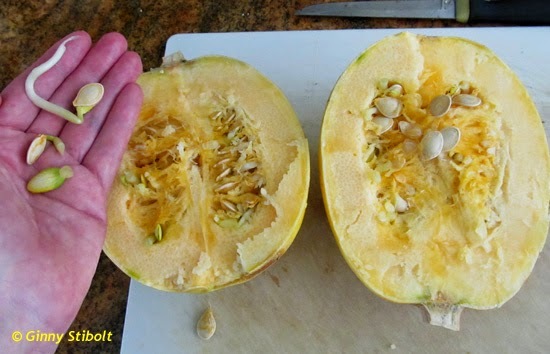 - Scoop out the seedy squash center and separate out the seeds. - Cook over medium heat until most of the water boils away—about 10 minutes. - Dump the contents of the pan onto a cookie sheet and spread the seeds out. - Dry in a 200-degree oven for 15 minutes or out in the sun for several hours. - Ready to eat: eat them by themselves or mix with other seeds & nuts in a trail mix. - Nuke for 10 minutes at full power. 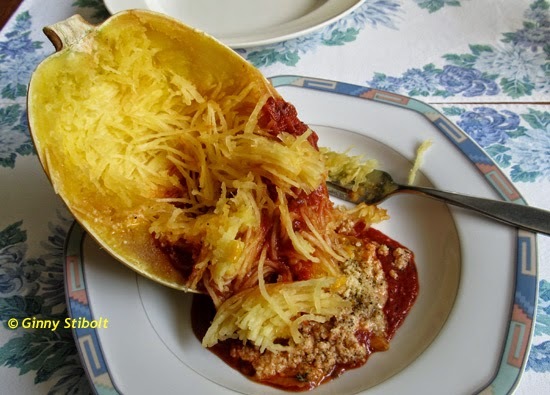 - Take the pan from the microwave, turn the halves cut side up and test the squash with a fork to make sure that it's soft. - Top with freshly ground pepper, oregano & parsley flakes and then grated Pamesan cheese. - There should still be some water in the bottom of the dish. Nuke for 5 minutes. - Serve whole in a bowl. Eat right from the rind or turn it out into the bowl. A delicious, filling, and gluten-free meal. Prepared squash it ready to turn out of its shell. 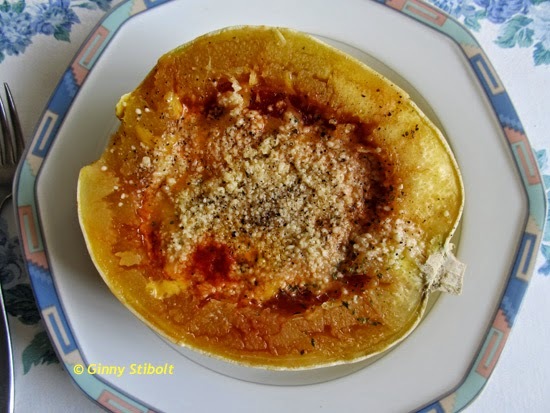 The meat of the squash is stringy and fills the role of pasta. The beginning of August is a little early for planting the fall squash crops, but with sprouted seeds, I couldn't really wait. My long bed opposite from the garage was turned and mulched 6 weeks ago, so it was ready. 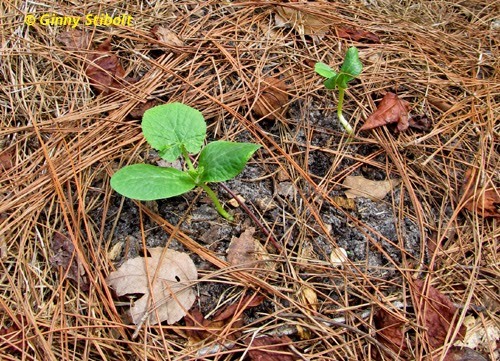 I planted several of the sprouted seeds on one side of the squash swale and some summer squash seeds on the other side. The spaghetti squash seedlings are in a row above my name in this triangular-shaped swale as shown in the photo below right. The summer squash is to the left. The vines are likely to grow out from the area so this section of lawn will host the runners and we'll mow around them until they are done. The sprouted squash perked right up when planted. For more details on how I prepare the squash mounds see my post, From compost to dinners My squash swale is at the far end of the outer bed. In addition to the spaghetti squash, I also planted some summer squash. I grow a lot of carrots from fall, through the winter, and into spring. We've enjoyed the cosmic purple carrots over the last couple of years, but this time, I decided to branch out with more colors. I'm not sure if I have any purple carrots seeds left over, but I do have some orange carrot seeds so I'll have a more complete rainbow. 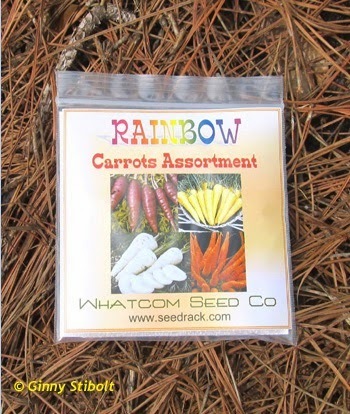 This seed pack includes deep purple carrot, yellow carrot, white Kutiger carrot, and nutri-red carrot seeds. Only the worms can see it. 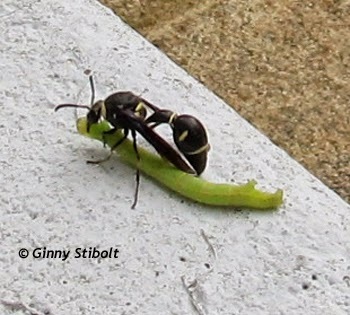 It's a wasp eat caterpillar world out on our front porch step. This is why landscape-wide poisons are not used in our sustainably-managed property. You want Mother Nature to send out the troops when there are too many caterpillars in the area. A potter's wasp found a caterpillar. It ate part of it, but then they disappeared. The wasp probably flew it to the nest, laid eggs on it and sealed it up. For 3 years we tried physical removal methods to knock back this invasive fern from our front pond. 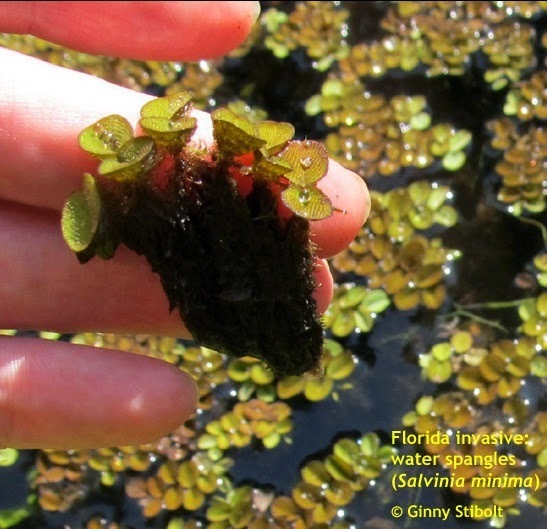 See what we did to get rid of this invasive floating fern from our front pond in my post over on Native Plants & Wildlife Gardens blog, "Managing a native pond." Finally, we have a clear pond again. 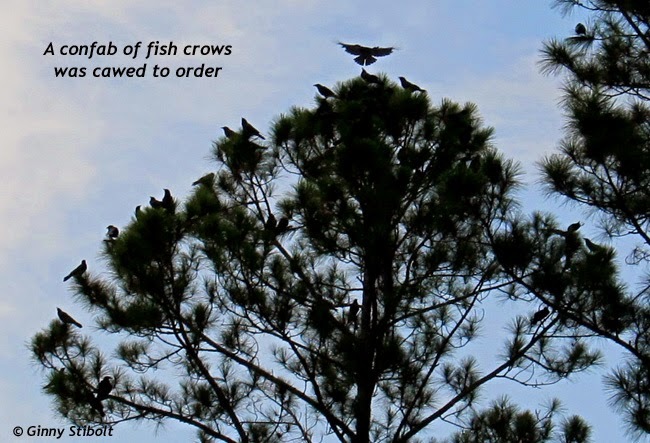 More than a hundred crows gathered in the trees around our yard the other day. They all hung around for quite a while having a noisy ongoing conversation, and then, they all flew off. We've seen large groups of crows before, but not very often. Summer's winding down, I can hardly wait to start planting more crops in my edible gardens again. What about you—are you ready for cool-weather edibles? 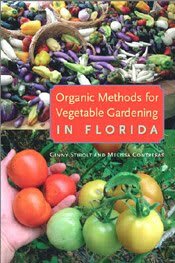 In our book, "Organic Methods for Vegetable Gardening in Florida," there are 3 monthly calendars—one for each section of the state. Order your copy today. My presentation is "Organic Gardening—You can do it!" Aug. 12th 10am at Fleming Island Library in Clay County. 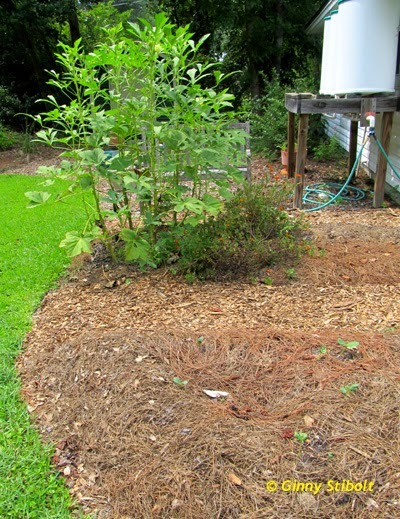 by The Garden Club of Fleming Island.